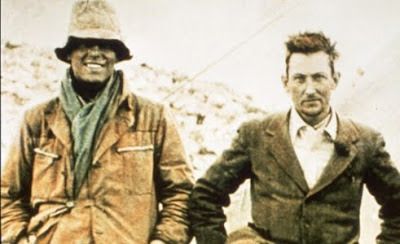 In 1924 an expedition to the summit of Mount Everest made by George Mallory and Andrew Irvine ended up with both men dead. To this day no one was able to say whether the men were the first to scale the world's highest peak. This was one of the biggest mysteries of Mountaineering that the Masters of Light finally unveiled. DID THEY REACH THE SUMMIT OF MOUNT EVEREST? Interlocutor: Before concluding the session I’ll move on to another topic related to Mountaineering, Did Irving and Mallory reach the summit of Mount Everest? I ask it because it’s one of the biggest enigmas in Mountaineering. Both of them were found dead closer to the summit, but nobody knew if they were climbing or they were descending from the summit. Ruanel: I visualize the staff of a flag on the summit of Mt. Everest, a person beside the flag and another below. Interlocutor: Which one of them reached the summit first, Irving or Mallory? Ruanel: Both of them arrived to the summit, but the first to reach the summit was Irvine. Ruanel: Correct. Then both of them died when they were descending. Interlocutor: I know the history. Anyway, as regards to Alpinism, the rule is descending with life. If one dies in the way down, regrettably that prowess is not accepted... I listen to your final message, Master. Ruanel: It’s important to use common sense in all the messages that are given. It is necessary to always keep in mind that the messages given by the Masters of Light will never hurt susceptibility, being this way the best way to realize if a message is good or not. Interlocutor: But the spirits of error also give messages, as if they were beings of Light just to deceive us! Ruanel: Yes, because the messages of error can pass as messages of Light, but one who is heedful will always recognize them, because fanaticism is always revealed. The messages of error have always nuances of fanaticism or they are leaned to a certain religion, Or directly they hurt the susceptibility of the people. Then one can realize that they are false messages. The true message of Light allows that everybody reaches God without hurting third people. On the other hand, there are many things that distort, there are many messages that are changed and that puts back enormously to mankind. Unfortunately the terrestrial humanity is at this time with 157 wars, it has hundreds and hundreds of different religions, but only for the lust of power. As long as mankind does not overcome these things, mankind won't be able to reach the so yearned change of conscience for the XXI century. Interlocutor: Master, I’ll interrupt you to ask you the following thing: First, I don't believe it, but it would seem that we are the only ones that are in the right Path. Concretely, Is there somebody else in the planet Earth who transmits with the same fidelity that Jorge has and of course, messages of Light and not those messages of error? Ruanel: There are three more people, and we are speaking of three among thousands of millions of human beings. Aside from your group there are three more groups that receive the messages correctly. Ruanel: Saying "Only representative" it’s very fatuous, since there is nobody that represents in the physical plane to the Planetary Hierarchy. And now I’ll tell you something that maybe you don't know: this vessel sometimes doesn’t believe it himself, and he questions many things. Ruanel: The only thing that keeps his feet on the ground… I mean, he realizes who he is, his manuscripts when he reads them are there , because the notes that he has written, dictated by his Thetan- Johnakan Ur El-, they are the most advanced notes in the planet, even comparing them with the notes of these other three groups that I mentioned. This vessel has written, at this moment, more than fifty notes, four books, including all the channelings with the messages that have been transmitted with 99% of fidelity, including the final revision naturally, and I testify about this. All the messages he channeled has not been said by anybody in the planet, besides all the explanations are coherent. Any person with a little common sense who reads them would realize its credibility and validity, because they solve in an original and reasonable way scientific enigmas as well as spiritual mysteries. I am tired, as a Spirit obviously - and you know that I am less permissive than Johnakan in this sense that when I have to speak badly I speak badly without roundabout words- about those networks that transmit messages widely with false interpretations brought forcibly about the "changes of conscience", with “dimensional beings” whimsical versions that they will come with "savior space ships" to save the "elects.".. Please! Ruanel: His age doesn't justify foolishness... That person continues saying that only 144.000 human beings will survive, like the Bible says... Please! In your country, Argentina, there was an author in the XIX century who said "shrimp that falls asleep is swept away by the current"
This means that the majority of people don't advance, and when they don’t advance they go back, and the worst thing is that they end up dragging others in their fall. And this is my final message: "No more old wineskins!” You are the new wineskins... I leave because the vessel is totally destabilized... A very big hug. Interlocutor: See you later, Master, thank you and see you later. This entry was posted at Friday, September 25, 2009 and is filed under History . You can follow any responses to this entry through the .